The common beech is a native to most of Europe including the southern half of the British Isles, but is not native to Ireland. It spread back into Northern Europe relatively slowly after the end of the last ice age and just managed to reach southern England before the formation of the English Channel. However by this time Ireland was already cut off by the widening Irish Sea and St Georges Channel. So, along with the snakes, moles, and nearly 400 plants, beech didn't arrive in Ireland until brought in, probably in the 17th century. 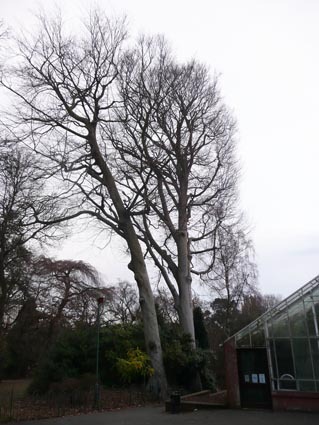 Beech grows well in Ireland and sets viable seed. 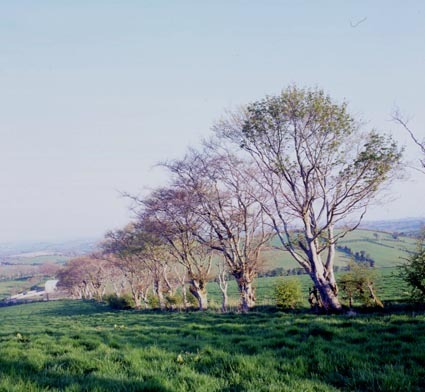 On the whole, individual trees are not very long lived as the species is prone to heart-rot fungi which weaken the trunk leaving it susceptible to wind damage. A particularly damaging pathogen is the bracket fungus Heterobasidion annosum (previously called Fomes annosus). Beech is a popular hedging tree in spite of the fact that it is deciduous. This is because, in the juvenile state, beech retains its dead leaves through the winter, shedding them as the new buds open in the spring. A well maintained beech hedge will keep this juvenile state throughout its life, but if the hedge is allowed to grow into trees it will lose its leaves in autumn (see below). Beech casts the most dense summer shade of all the European deciduous trees. Only early spring flowering ground plants can survive under beech - notable among which are bluebells. 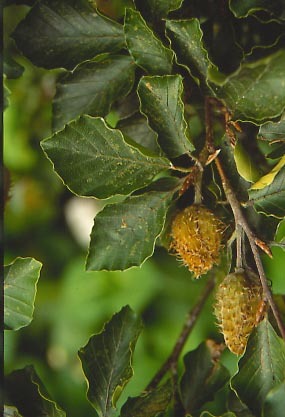 The seed of beech is a small edible nut, triangular in section, known as beech mast. Beech bark is a very characteristic smooth grey. 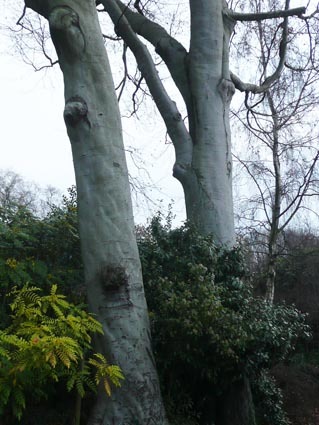 There are a number of beech trees in the Gardens; the tag numbers and location given above are for the trees photographed below, close to the Ravine. Leaves and fruit of common beech An old beech hedge that has turned into a row of trees and has lost its juvenile characteristic of retaining leaves in winter.